Lung cancer usually manifests in the cells lining your bronchi, or the bronchial tubes that help deliver oxygen to your lungs and bloodstream. The National Center for Biotechnology Information states that there are two main types of lung cancer: non-small cell and small cell. Non-small cell accounts for about 80 percent of all lung cancer cases. 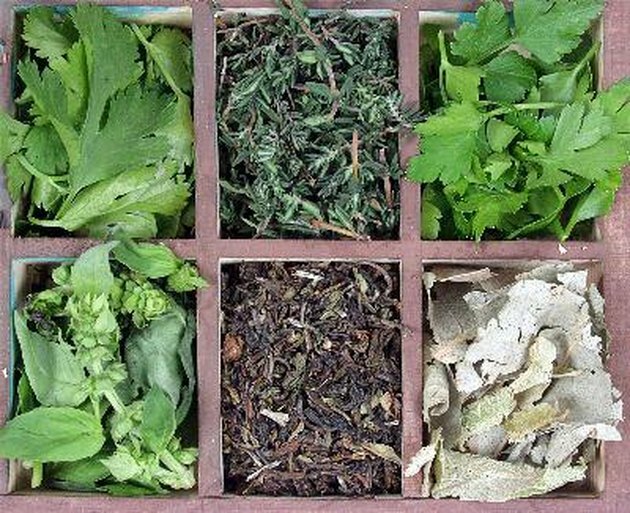 Certain herbal remedies may be a helpful adjunct therapy in your lung cancer treatment, although you should always clear the use of any herbs with your cancer specialist beforehand. Lung cancer is a common health problem, especially among smokers. LungCancer.org estimates that in 2009, over 200,000 American men and women were diagnosed with this serious health condition. Smoking -- including the consumption of secondhand smoke -- is the leading risk factor for developing lung cancer, although genetics, air pollution and radiation are other common contributors to the development of this condition. Chest pain, shortness of breath and coughing up blood are common signs and symptoms of lung cancer. Though herbal remedies have long been used as an adjunct treatment therapy, not all herbs used for this health purpose may be backed by rigorous clinical research trials. The University of Maryland Medical Center (UMMC) reports that three herbs -- American ginseng, Asian ginseng and grape seed -- are among the most helpful natural remedies in treating your lung cancer. Other herbs known for their cancer-fighting ability include astragalus, ginger, turmeric and thyme. Asian ginseng is a powerful herbal remedy that may be helpful in treating your lung cancer. According to the UMMC, some studies suggest that this herbal remedy may lower your risk for certain types of cancer, including lung, liver, stomach, ovarian and pancreatic cancer. Other studies show that Asian ginseng may suppress tumor growth, although the UMMC concedes that further research may be required to verify this health effect. Asian ginseng may also be helpful in improving your mental and physical endurance levels. Lung cancer is a serious illness that should always be managed by a qualified health care professional. Herbal remedies should never be used in place of other treatment strategies recommended by your cancer specialist. Herbs may best be used as an adjunct therapy in the treatment of lung cancer, as the use of herbs alone does not guarantee a specific health result. Herbs may contain powerful medicinal ingredients and should be treated with the same caution you would use when taking prescription drugs.